Creating Easter Cupcakes is probably the best opportunity of the whole year to have fun with your decorating. There are so many ideas for Easter cupcake decorations, you will have trouble sticking with just one! Easter means chocolate - there is something about all those chocolate Easter bunnies that makes this the perfect season for decadent chocolate cake, smooth chocolate filling, and rich chocolate frostings. As you start planning your cupcakes, consider all of the different options you have for chocolate, whether you want to create gourmet Belgian chocolate cake, creamy chocolate ganache fillings, or experiment with a new chocolate icing recipe. Start by covering your cupcake with green frosting, and place tiny candy eggs around the outer portion of the cupcake. Use shredded coconut to create a "nest" in the middle of the cupcake, and place a marshmallow chick in the middle. Create Easter sheep out of marshmallows attached with a bit of frosting. Add details with frosting, black jellybeans, or bits of candy. Cover cupcakes with chocolate icing, then top with shredded coconut "grass" that has been dyed green. Create flowers from your favorite cookies, and "plant" them in the cupcake for a bright display that is perfect for any spring time event. Use two cupcakes to create the perfect bunny. Cut two ear shapes (long ovals) from the top and bottom of one cupcake, leaving a bow-tie shaped piece. Attach the ears to the top of another cupcake, and place the bow-tie at the bottom. Decorate the bunny, adding details with piped icing. For an elegant display, start by icing cupcakes in a single color using a smooth icing or fondant. Purchase miniature cookie cutters in an Easter theme, and cut shapes from white fondant. Place the shapes on top of the cupcakes, and you will have beautifully silhouetted designs that are perfect for religious events. 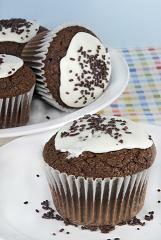 To create cupcakes that truly stand out, start with chocolate cupcakes that have been levelled. Decorate the outer surface of the cupcake (where the wrapper would normally be) using a basket weave icing tip. Next, use piped green icing to create "grass" in the basket. Add small candy covered chocolates or any other Easter candy, and you will have an adorable and edible Easter basket. For a cupcake take on the traditional hard boiled egg, consider decorating chocolate eggs with fondant or icing. Adding touches such as initials for each of your guests can also turn these cupcakes into a showpiece. Once you have decorated the eggs, place them standing on end into cupcakes decorated with cupcake wrappers that serve as "egg cups". Create unique filled cupcakes with this simple trick. Start with freshly washed whole strawberries with the leaves and stem still on. Bake cupcakes, and then gently push a whole strawberry into the cupcake so that the leaves remain above the surface. Ice the cupcake with a simple white icing, and display your strawberry filled treats on a beautiful, tiered cupcake stand. You can't go wrong with chocolate cupcakes, chocolate ganache and chocolate sprinkles or candies. This would be a chocoholic's dream and a real winner. For those that want a break from chocolate, try my Easter Spice cupcakes. The wide variety of Easter candy offers a limitless source of ideas for cupcake decorations. Browse the aisles of your local grocer to find candies that you can turn into decorations. Don't forget, kids have as much fun decorating cupcakes as they do dyeing Easter eggs, so now is a great time to create a new Easter tradition for your family. If all this has inspired you, wait until you see the range of products that can make making and decorating your Easter cupcakes so much easier. Below are a few of my favorite products, ranging from cupcake papers to cupcake picks and toppers. Have you got some great ideas for Easter cupcake Decorations? How do you decorate your Easter cupcakes? Do you have photographs of cupcakes that you can share with us? We'd love to see pictures of your cupcake masterpieces. Did the children make cupcakes and decorate them? Is there a story to share as well?